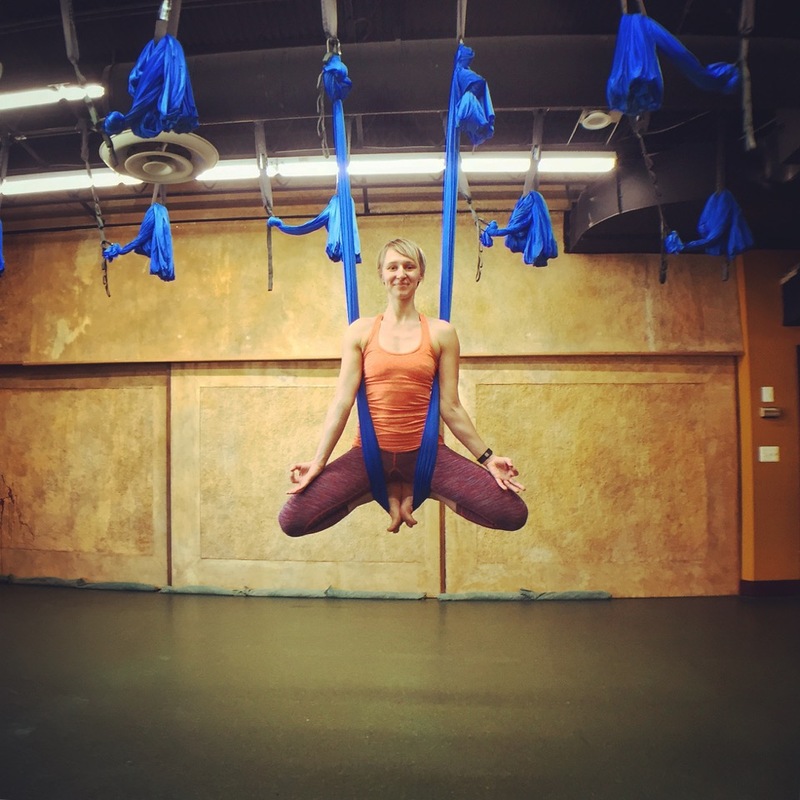 It used to be very difficult to find a yoga studio where you could practice aerial yoga…but now it’s popping up everywhere! I’m finding that many people are extremely curious about it but for various reasons (mostly stemming from fear) they haven’t tried it yet. But, if I were you, I’d try it immediately, if not sooner. It’s not just for acrobats. You don’t need to have a regular yoga practice to start. Absolute aerial beginners are welcome—most studios offer classes for all levels, just ask. You’ll start on the ground with plenty of time to get used to the fabric first. During class, the fabric pressing into you can be pretty uncomfortable at times. After class, you might be a little sore – similar to after a deep tissue massage (because that’s basically what you just got). The odds are in your favor that, if you follow your teacher’s instructions, you won’t fall out of the fabric. Don’t eat a meal in the 2 hours leading up to class. You’ll leave class feeling taller and lighter (who doesn’t want that, right?). Leave the jewelry at home— if you don’t, you’re risking injury if it gets caught in the fabric, and you can really damage the fabric too. At the point when you’re upside down, you’re really only about 3 inches off the ground. Motion sickness can occur in those who are prone to it. It’s recommended that you wear a shirt with sleeves to protect the skin around your armpits and don’t show up in shorts either— if the possibility of friction on sensitive body parts doesn’t scare you, then perhaps the high likelihood of indecent exposure might. You will learn to let go of fear; it will make you feel free. You will learn to trust in the support of the fabric. It’s therapeutic, relieving compression in your low back, opening your hips, and stretching your spine. You’ll find that, with the help of the fabric, stretches are deeper and juicier. You will want to buy an aerial hammock for your home. You will find that you’re stronger then you think. The Aerial Savasana is seriously the best thing ever. Special thanks to Thrive Yoga and Dorota Preysnar, the lovely studio and Certified Aerial Yoga Teacher featured here, for enabling us to capture such beautiful photos and video of the practice in action. Did you know that AcaciaTV is now available on Amazon Prime? It’s true! You can also get your first 100 days of AcaciaTV fitness for free HERE — use the code tryacacia4free to get started. Stay up to date with all the latest happenings so you don’t miss a beat by following us on Facebook, Instagram, and Pinterest!